Inputs are responsible for much of the power in the way we allow your internal stakeholders to edit documents without risk. They allow us to isolate elements that can be edited within documents and define exactly how they are edited. So what types of inputs are there? 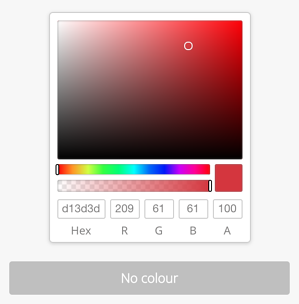 Our colour inputs allow us to change the colour of items like text, shapes and colour treatment overlays using your on brand RGB or HEX colour codes and represents your choice clearly on a WYSIWYG visual colour chart. The colour input even allows you to click and drag to select a random colour with the preview updating automatically, live on your document. Capitalising on the ample permissions and segmentation functionality of the Outfit Asset Library, image inputs allow stakeholders to replace placeholder images with either a selection of approved images, their own uploaded images or a mixture of both. Image inputs also allow images to be repositioned within a frame to ensure correct focal positioning. Choice inputs enable us to add a predefined suite of controlled options that the editor of a document can choose from to change elements of a document. Spreadsheet inputs allow us to import CSV spreadsheets full of data to populate multiple elements of a document. These spreadsheets can be used for text data, images, tables and even to populate charts! Collection inputs may remind you of email builder software as they are designed to give the document editor to add sections of a document in blocks. Collections allow us to group together the inputs necessary for each block so that we can focus on editing one block at a time. You'll get to know each of these inputs very well as they become an integral part of every template you build in Outfit!